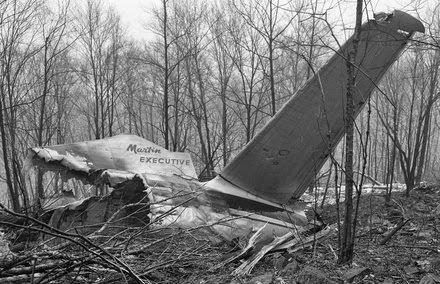 One man's quest to memorialize the victims of the worst airline disaster in Lycoming County history, the crash of Allegheny Airlines Flight 371 on Bald Eagle Mountain, is coming to an end. The crash site has received designation from the Commonwealth as an official archaeological site. In addition, plans are under way for a monument to be installed onsite. Shane Collins, whose personal efforts to honor the victims of Allegheny Airlines Flight 371 will discuss his journey at 6:30 p.m., Dec. 1, at the Lycoming County Historical Society, an event sponsored by Northcentral Chapter 8, Society for Pennsylvania Archaeology. Collin's presentation falls on the 55th anniversary of the accident, which occurred Dec. 1, 1959. According to the Civil Aeronautics Board records of 1960, the pilot of the Martin 202, N174A, failed to "execute a timely abandoned approach" at the Williamsport Regional Airport, most likely because the compass was not working properly. CAB officials investigating the crash 55 years ago, theorized the snowy conditions inhibited the pilot from landing, and when he turned the plane to try again, a crewmember may have accidentally bumped the fluxgate compass, tampering with the settings. Rather than approaching the airport, the off-course plane flew into the side of Bald Eagle Mountain, its engines racing and the nose pointing upward once the pilot realized his error. It crashed at 1,150 feet. The flight originated in Philadelphia, picking up more passengers in Harrisburg. It was bound for Cleveland, with stops scheduled at Williamsport, Bradford and Erie. The aircraft carried 23 passengers and a crew of three, including the pilot. Only one passenger survived. Collins learned about the airline disaster from a family member. "As a teenager in the late 1980s, I first heard about the crash of Allegheny Airlines Flight 371 from an uncle of mine who had been to the crash site on Dec. 1, 1959. As a young man in the National Guard, he heard the announcement about the crash as it was being broadcasted over the radio," Collins said. "He immediately decided to volunteer his services to help look for survivors. The part of the story he told that shocked me the most was the smell of burning bodies and plane wreckage. He mentioned to me that it was something he never forgot." In the mid 1990s, Collins decided to look for the crash. "After researching the archives of the James V. Brown Library, I planned a hike to Bald Eagle Mountain. I searched the area where I believed the plane had crashed but was unable to find the crash site or any debris. I returned several more times in those days but again, came up with nothing," he said. "This past spring, I again found myself thinking about Flight 371. I decided to contact my cousin, Mark Avery from Spencer, NY, to see what he thought about helping me research the crash once again. He and I searched online for information and to see if anyone had or has been to the site since 1959. We were astonished to find out that no one to the best of our knowledge had been there. It was then we decided to hike over to Bald Eagle Mountain in search of Flight 371’s location. "With a GPS, we set out on a very cold and rainy April day. After many hours of hiking the areas we thought the plane might have crashed, we came up with nothing. Exhausted, convinced nothing was there, we decided to return home and make a decision whether or not to return," Collins said. In May 2014, he and Avery revisited Bald Eagle Mountain and finally found the crash site, which is located on state lands. "On the May trip we discovered our GPS was not giving us accurate readings. We knew the elevation we needed to find was 1,150 MSL. After recalculating the GPS app, we decided to look a little while longer while on this hike. A few hours later we came to a trail road and decided to look around," he said. "We found a small piece of metal with rivets. We became overjoyed with excitement as we were certain this was the right location. As we continued to search, we discovered pieces of metal that definitely looked like aircraft parts. "Just before we decided to leave, as we were hiking away from the site, we came over a little rise and there they were, several large pieces of plane debris lying on the ground. We could not believe what we were seeing. The fact that they still laid there after all these years was amazing to us," Collins said. He began researching the airline disaster, trying to piece together the story behind the crash and the rescue efforts. In the process, he decided that a monument should be placed onsite, to memorialize the 25 victims who died on the mountain, and the lone survivor. In September, Collins contacted Lycoming College's archaeology department to ask for guidance. A loose coalition formed, its membership consisting of individuals from Lycoming College, Northcentral Chapter 8, Society for Pennsylvania Archaeology, Armstrong Township and Auman Landscape Architecture (working on behalf of Susquehanna Greenway). The group hiked the tortuous path to the crash scene to record the site and initiate the process of protection. Lycoming College's archaeology department, working hand-in-hand with Northcentral Chapter 8, SPA, will oversee site mitigation and has begun mapping the the site. Once the site has been mitigated, donations will be sought for the costs of a monument and interpretive panels. The public is invited to listen to Collins on Dec. 1 at the Lycoming County Historical Society, but are discouraged from visiting the site. Not only is it on state lands, it is an active archaeology site, permits pending. More information about the airline disaster can be found on Collin's website, http://www.alleghenyflight371.com. "The Lord opened my side of the plane and I was able to jump out." Louis Matarazzo, 35, of Springfield, Pa., thanked God for his life from a hospital bed in nearby Williamsport. He was the only survivor among 26 persons aboard a twin-engine Allegheny Airlines plane which crashed Tuesday, into a 1,400-foot mountain during snow and poor visibility. "I fought my way through flames, past the wreckage," explained Matarazzo, who is president of a Philadelphia sportswear company. "I tried to make my way back to the - wreckage but couldn't make it My legs were too stiff. The pain"
When a Catholic priest who was flown into the disaster area by a helicopter came to his side, Matarazzo told him: "Thank God, father, you are here." Recalling events just before the crash, Matarazzo said "All of a sudden the pilot seemed to race the motors and pull up. There was a crash. The plane burst and exploded."